What Do You Mean “No More Straws”?? Unless you’ve been living on Tom Sawyer Island, you’ve most likely heard that changes are coming to Walt Disney World. 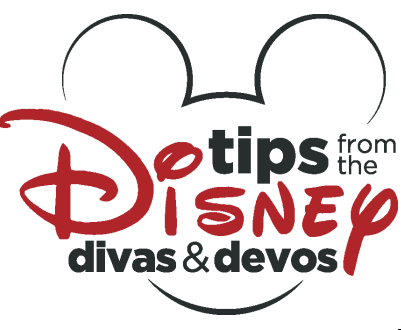 Recently, Disney announced changes in regards to their usage of plastic items that are eventually going to impact your future vacations at Walt Disney World. It was announced that most, if not all, single use plastics would be eventually eliminated. This would impact things such as plastic straws, stirrers, and shopping bags. Ironically, in the same week, Disney announced that Ziplock would be a new sponsor for Splash Mountain and that they will be providing Ziplock bags to their guests to use to protect their phones and other electronic devices. Some how I think the PR department dropped the ball on this one but I do hope that there will be some sort of system where people can turn their bag back in for reuse. Our dependence on single use plastics is having a huge and detrimental affect on our environment. It’s easy enough to say “but it’s just one straw” and that’s true, but when you consider the possibility that you may use one straw each day, that’s 365 straws per year. The average life expectancy in the United States is 78.7 years. I’ll let you do the math on that one, but remember that we’re just talking about YOU. The current United States population is around 326,766,748. How many Disney Parks shopping bags do you end up bringing home with you after a Disney vacation? Where do those bags end up when you’re finished with them? What about the bags from grocery shopping? What about those cups filled with your favorite drinks? Remember, this is just you. Just one straw, right? So take all those straws, all those bags, the cups, the lids and multiply that by your use over an average life time. And still, that’s just you! But you still have to go further and multiply that by 326,766,748 to get a true impact. Oh and don’t forget, that’s just the United States. We haven’t began to talk about the other 194 countries in the world. Not to mention that the United States rates third in regards to population. Are you awake yet? We are destroying the world one straw at a time. Considering that the Magic Kingdom is the number one most attended theme park in the world, I’m sure you can see why Disney is starting to take notice. It is, of course, no surprise that there has been some criticism. There are people who rely on straws for their ability to drink. For some it’s just a matter of preference or habit but for many, straws are a necessity. So I’m writing this article for you. I’m also writing this to those to already care about their impact on the environment and want to start making changes now, even before Disney implements any of their changes. Straws. This is going to be a tricky one. So my tip really isn’t “do this for straws” or “do that” but do have patience while Disney sorts this all out. 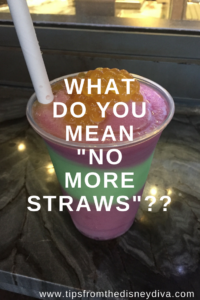 Currently, plastic straws are on the list of prohibited items. So bringing your own straws isn’t really going to be an option. I chatted with a Cast Member who claimed that while Disney is “eliminating” straws and while the rule on prohibited items isn’t going to change, that plastic straws will still be available upon request. That seems totally logical to me and seems very “Disney like” so I imagine you won’t run into any major issues. I’m thinking that Disney is just using this strategy to lower it’s plastic waste, not necessarily eliminate it. Of course it’s totally possible that these “straws upon request” will actually be paper. So be aware of that. Shopping Bags. Now this is something that I often do anyhow. Bring a backpack! If I’m purchasing small items, instead of having the Cast Member place the item in a bag, I’ll just ask them to save the bag and I place my purchase in my backpack. 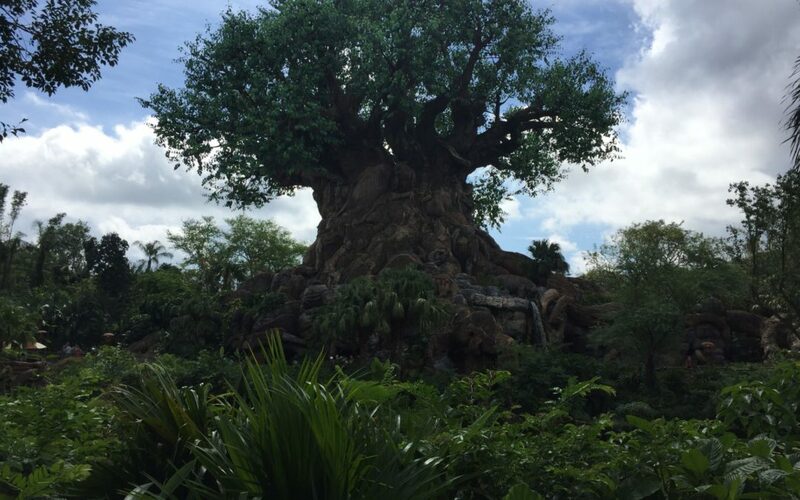 You could also ask that your purchases be sent to the front of the park or if staying at a Disney Resort, you can have your purchases sent there. I know some people like to keep a bag as a souvenir, and I get that. But just get one. Do you really need 20? Bottles/Cups. Instead of buying multiple bottles of water or soda, bring your own reusable cup or bottle. There are many options out there, including Disney themed bottles! 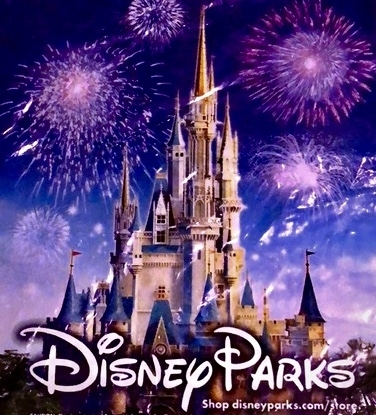 Just make sure that they are not made of glass as glass items are prohibited from being brought into the parks. There are other little changes you could make. Instead of taking three or four paper napkins at the quick service restaurant, consider just taking one. You could always go back and get more if needed. Even better, you could bring your own cloth napkins. I know that may be a bit extreme for some people but for others it could be great option. Do you really need a spoon, a fork, AND a knife? Only take what you really need. There are so many things you could do. Some are extreme but some are not. You really just have to put a little thought into it and see how you can make changes in favor of our environment. Sometimes that’s all it takes. Regardless of what changes you make or don’t make, please DO NOT just throw your trash on the ground or leave it lying around. There are trash cans everywhere! There’s really no excuse for leaving your trash anywhere but a trashcan. That right there is the best thing you can do! Not only is that better for the environment, it also helps keep Walt Disney’s dream alive of having a good clean place for families to have fun! Think of those 30 steps to the trashcan as your investment in that dream! 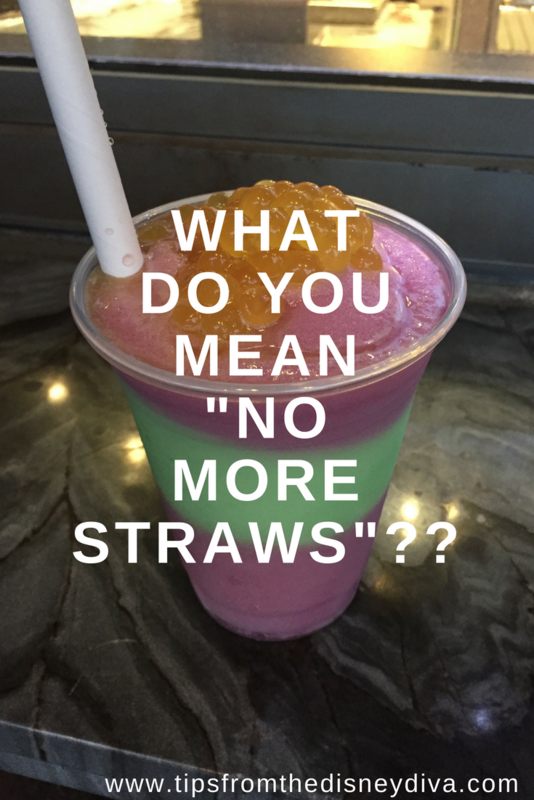 Highlights of 2018: What Do You Mean “No More Straws”?? 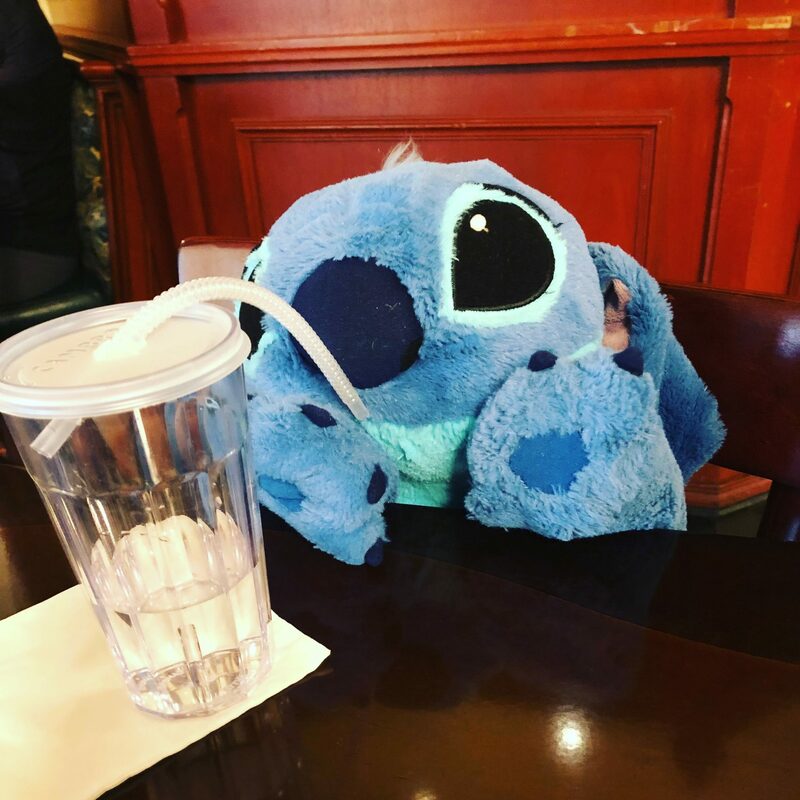 Are you still allowed to bring steel straws in the parks? Or is it all straws that are banned now? Hi, Kaley! It’s my understanding that you will be allowed to bring metal straws into the parks! I don’t think their intent is to “ban” straws, but to help cut down on their usage of plastics. So you should be good to go!